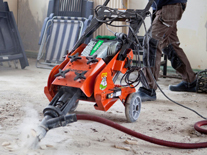 The CTS12 RIP-R-STRIPPER is a highly productive solution for removing ceramic tile, hardwood flooring materials and other covering removal applications for both commercial and DIY projects. 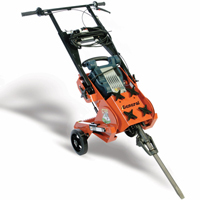 A direct, impulse type blow force is provided by a wide range of 35 lbs weight class electric breakers manufactured by Hilti, Bosch, Makita and Hitachi. An impulse blow is required to break through the high bond strengths provided by todays mastics, glues and thin set materials. The unique design configuration allows the operator to work in a more productive, upright position and significantly addresses jobsite exposure to knee and lower back related concerns. A wide range of industry- standard, 1-1/8 inch hexagon x 6 inch shank accessory tools, including chisels and scraper blades, are available to meet a variety of labor intensive, floor covering removal applications. Designed for easy transport in small vehicles. 12 inch maximum scraper blade width. 9 position, self-locking, accessory tool angle adjustment. Gas shock counterbalance for smooth, easy movement. Power Source: 35 lbs weight class electric breakers, 115 VAC, 15 ampere.